The Web Site Maintenance Agreement is an agreement used when taking over the maintenance of an existing project/web site or when you are separating the development agreement from the maintenance agreement. Use this to specify exactly what the client is getting in terms of maintenance, and also to disclaim what you will not do and what you are not responsible for. This Web Site Maintenance Contract is included in editable Word format that can be customized in Word or by using the included Wizard software. THIS AGREEMENT is made this Current Day day of Current Month, Current Year by and between Company Name ("Company") and Company Name ("Customer"). Company is acting as an independent contractor, and is not acting as an employee of Customer. Insert names of projects to be maintained. Customer is engaging Company for the specific project of developing and/or improving an existing World Wide Web Site. The Customer will establish a separate contract with an ISP or Web Hosting provider, or Company will establish one on behalf of the Customer. The Customer hereby authorizes Company to access this account, and authorizes the Internet Service Provider to provide Company with "write permission" for the Customer's web page directory, cgi-bin directory, and any other directories or programs, which need to be accessed by Company for this project. Company will provide minor updates to the Web Site for a period of 6 months. Minor updates should not exceed more than 40% content change of any single page. Maintenance and changes shall not exceed one (1) hour per month per every 6 web pages, the hourly Maintenance rate will be applied thereafter. No other parties shall have the right to change the Web Site during the maintenance period. If the Customer or an agent other than Company attempts updating the web pages, time to repair web pages will be assessed at the hourly rate, and is not included as part of the updating time. For all of Company's services under this Agreement, Customer shall compensate Developers, in cash, US $350.00 on a monthly basis, or as defined in Exhibit A. In the event Customer fails to make any of the payments referenced by the deadline set forth in Exhibit A (Payment Terms), Developers have the right, but are not obligated, to pursue any or all of the following remedies: (1) terminate the Agreement, (2) immediately stop all works-in-progress or remove unpaid for material, (3) bring legal action. Company will provide up to two (2) hours of consultation per every 4 web pages, the hourly Consultation rate will be applied thereafter. Edit, revise, update or create new content on existing pages based on Customer request. Provide consultation service for any projects that impact the Web Site and/or projects defined in the project specified above. Provide disaster recovery from backup and maintain a current file library of all assets, graphics, source code and revision history for Customer's Web Site. Offer advice and guidance on Web Site management and marketing. Liaise with hardware engineers, hosting customer support, and other affiliate service entities. Create new graphics, content, code, scripts, media, or other additional elements without which are not outlined in Sect.2. Liaise with billing and/or accounting of your hosting and domain service, unless directly provided by the Company. Monitor operating system or Server Status unless otherwise specified and agreed upon. Be responsible for errors and omissions contained in Web Site content. Install patches, fixes, updates to operating system or server; install additional software packages to the operating system or server; install patches, fixes or updates to additional software packages. Any revisions, additions or redesign Customer wishes Company to perform which is not specified in this document shall be considered "additional" and will require separate Agreement and payment. Company shall advise Customer on any requested work that falls within these bounds. You may cancel your Web Site Maintenance Agreement with us at any time, by giving us one month's written notice, provided that payment is up-to-date. A pro-rata refund will be given for any unused period of the advance payment. In the event of a fault with your web hosting service or server, we will initiate an inquiry into the service disruption within 24 working hours of the fault or support issue being reported or observed. In the event of a hardware or software fault being found, the software or hardware maintainer will be contacted and Company will negotiate with them on the Customer's behalf. In the event of an operating system fault, Company will endeavor to solve the problem as soon as it is possible. This contract, together with the links herein, constitutes the sole agreement between Company and the Customer regarding its Web Site Design Service. It becomes effective only when signed by both parties. Regardless of the place of signing of this agreement, the Customer agrees that for purposes of venue, this contract was entered into in County county, State, Country and any dispute will be litigated or arbitrated in County county, State, Country. This agreement shall be governed and construed in accordance with the laws of the State of State, Country. 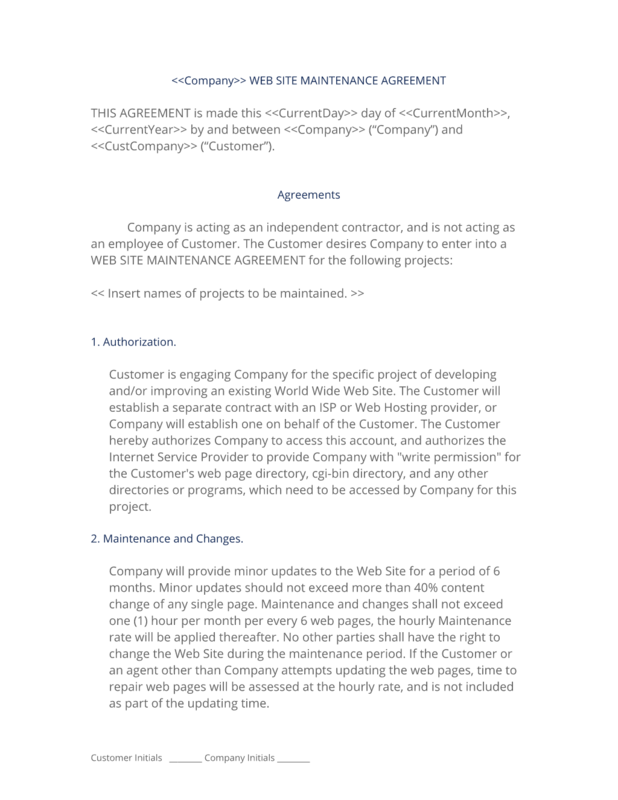 The complete Web Site Maintenance Contract - with the actual formatting and layout - is available in this Contract Pack.